I lived and worked in Greater Manchester 20 years ago. During that time, the peace and spiritual essence in Chadkirk estate, together with the company of the garden team, really helped me through difficult times. I worked hard with Pat and Mary and remember John for his enthusiasm, knowledge of the natural history, birds etc. and his wonderful estate work. We were a small group: myself, Pat, Mary, Sheila and her husband Peter, and John plus another couple. Pat and I went on an apple tree / orchard course over two weekends and I remember the seeds she and Mary grew. Awaiting funding for the restoration of the walled garden, we had numerous meetings at Pat’s home during which we studied maps and plans. Renovators of the chapel in previous years had discarded material into the walled garden seemingly using it as a junk heap. So then there were weeks of weeding out bricks, stones and glass from the garden beds which had been constructed by Stockport council, following Pat’s design. Eventually we started the planting. I remember the joy of watching plants growing, and the satisfaction working on maintenance in the garden we had helped to create. I had five happy years working at Chadkirk and seeing the walled garden transformed for all to enjoy. Thank you for a most informative and fun blog. 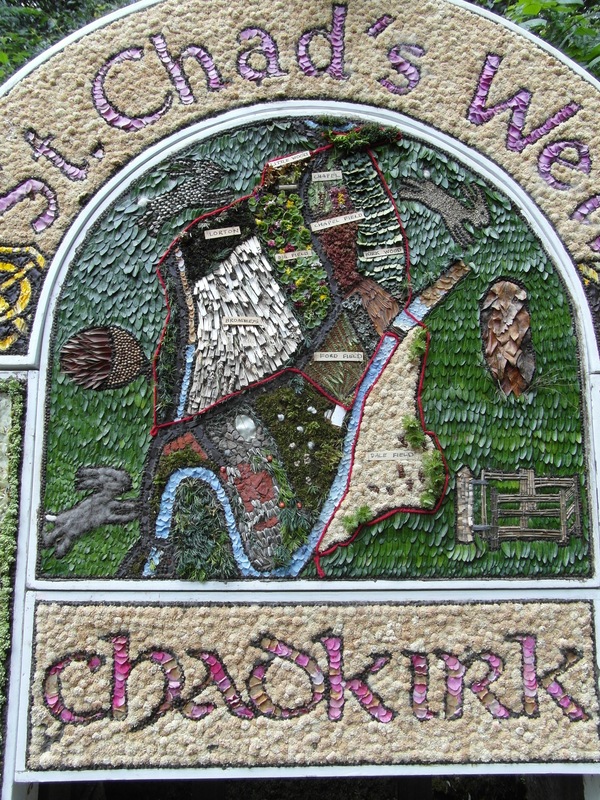 After last weekend’s successful Well Dressing at Chadkirk, the team will be back again this coming Saturday. The first Saturday of every month is a Gardening Day in the gardens at Chadkirk. During the afternoon we meet by the Chapel and in The Walled Garden. Each person does a little bit of the work maintaining and improving the gardens. Sharing the activities means that we each do a little and we all gain a lot. So if you enjoyed your visit last weekend, or if you visit Chadkirk regularly, you can add to your enjoyment by joining the folk who garden. Gentle activity, beautiful location, sheltered garden, sharing the delights of being out in the open air, breathing in the scents of the garden. Birds. Bees. Woodland. And a cuppa and chat. Saturday 5th August 2-4pm Chadkirk. 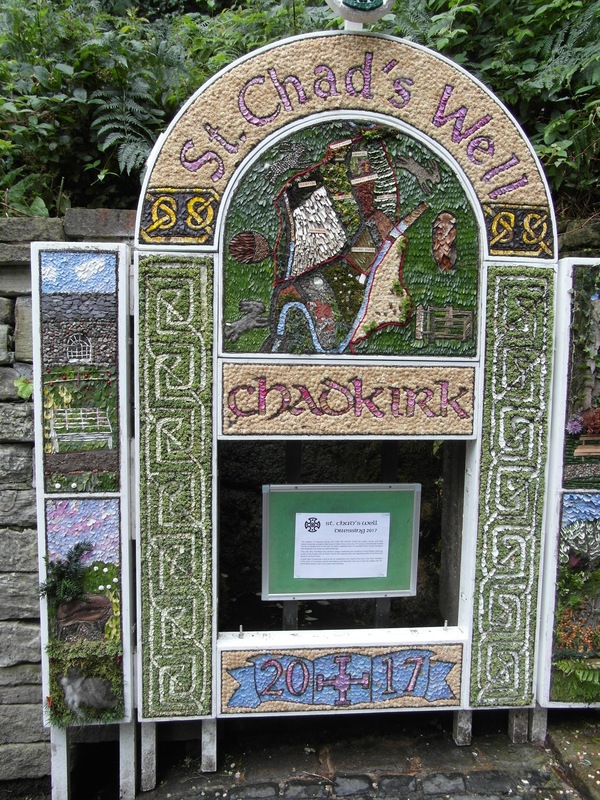 St Chad’s Well is still looking good down at Chadkirk. Local landscape (in petals and bark). 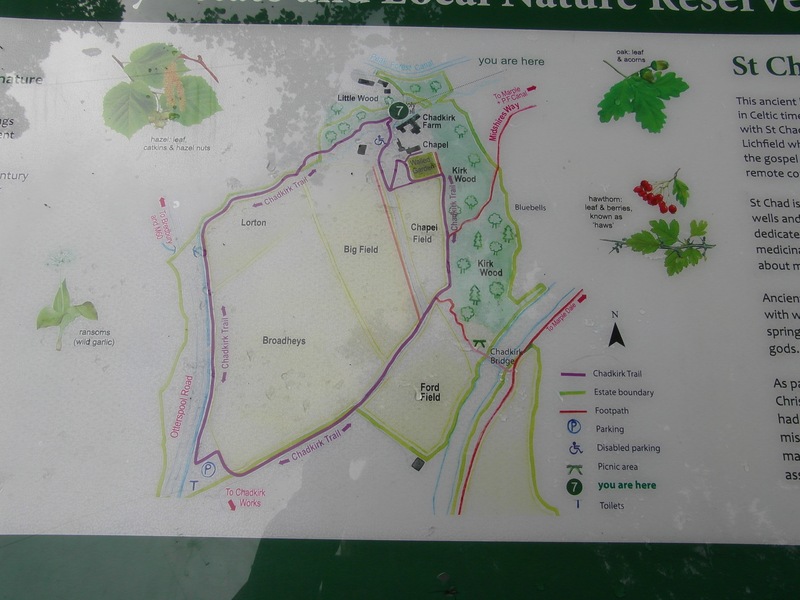 A map of Chadkirk Country Park and Estate. Yesterday’s vernal equinox marks a change. From now, until September, days will be longer than nights. At first, by minutes and then by hours. As we move into spring and look towards summer, there are more daylight hours to spend out and about. This coming weekend, there’s even more to celebrate. Our clocks spring forward by an hour at midnight on Saturday 26th March, so there’ll be an extra hour of light in the evening. Plants affected by the lengthening daylight add new growth, or open into flower. A recent spell of dry weather, some blue skies, sunshine and warmth, all encourage growth and blossom in the woodland, meadows and hedgerows of Chadkirk. By the time the weekend arrives, there’ll be newly invigorated bees and butterflies visiting the flowers in the garden, searching for food. A little something to energise them for their spring activities. Bees and butterflies will feed off the nectar of the spring flowers. Meanwhile, there’ll be something sweet on offer for the young of our own species on Bank Holiday Monday. On Monday 28th March between 2pm and 4pm, volunteers from the Friends of Chadkirk offer a bit of fun and a sweet treat for participants in our popular Easter Egg Hunt. Hidden eggs in the garden and grounds wouldn’t be much fun for anyone – they might melt in the sun, get washed in the rain, eaten by animals. So as an alternative there’s a game of scrambled eggs. Follow the clues and at the end, there’ll be a creme filled egg for each child taking part. Entry is 50p per child. The game is suitable for children upto 8 years of age, accompanied by adult carers. In 2015 this was one of our most popular events, organised by volunteers, in a spirit of generosity. They made a choice. The emphasis is on attracting young ‘uns. Time enjoyed here means that they, like us , will have a special connection with this special place. For the Friends of Chadkirk, while this event may not add much to our funds, it spreads the joy… what Easter, holidays, friends and Chadkirk are all about. There’ll be a different kind of delight for those who join our Easter Sunday service on 27th March at 3pm which will be led by Rev Jon Lyndsey-Scott of St Chad’s Church in Romiley. At this service there will be an opportunity to donate to a local charity. All money collected will contribute to Romiley Arc. Resourceful and energetic, friends can help us make the best of life. At last night’s AGM you’d get a clear sense of the difference that Friends make. They make a difference through their funding of projects on the Chadkirk Country Park, Farm Estate and in Chadkirk Chapel. In the past that has included the design and installation of the East Window. Later this year, footpaths in the Walled Garden will be repaired and re-surfaced, funded by the Friends of Chadkirk. There are many ways that funds raised and donations are used to benefit the environment and the community here. While raising funds for Chadkirk is a big part of what we do, Friends of Chadkirk also raise money to make donations to a wide range of other causes. Our treasurer reported back at the AGM about money donated to charities local and global. At the Carol Service in December, the collection raised nearly £300. The collection of £296-64 was donated to the British Red Cross fund, this small contribution to a global fund to take compassionate action within the refugee camps of Syria. In previous years, similar donations have been made to funds to support those affected by the flooding in Cumbria, Guide Dogs for the Blind and other diverse organisations. It is a reflection of the place that Chadkirk occupies in people’s hearts, that along with funds raised at events, we also receive donations and bequests. At the meeting last night, we were moved to learn of a bequest from a special friend of Chadkirk who had travelled by bus to help us get our beehives established and to take good care of them. Although that baton has been passed on, the continuity of his affection for the bees and this place has been movingly expressed. If Wilf’s family read this, we’d like to say a very special thank you. Please get in touch. Together we might be able to tell a little of his story and honour his achievements, the part he played in helping create the Chadkirk we enjoy today. Many visitors would be interested to learn more about our hives and his work with the bees. Moving through the agenda from the happenings of 2015 there was talk of plans for 2016. The events, which generally have a monthly pattern, start this weekend. On Saturday 5th March the gardening team will be active in the Walled Garden (as long as today’s snow has melted away). On Sunday 6th March Friends of Chadkirk will be offering something a little bit different by way of treats, entertainment and convivial chat. For this year we’ll be doing what we can with our existing technology to show our little in-house life story of St Chad, back by popular demand. By next year we hope to be able to use an upgraded system which we are currently checking out and plan to install soon. This upgrade has been made possible by a significant donation from a member of the local community. No upgrade is required for our popular Easter Egg Hunt. Last year this attracted many youngsters and their carers and at 2pm on Easter Monday – 28th March – there’s another chance to seek out what’s hidden in the gardens of Chadkirk. A different kind of delight for those who join our Easter Sunday service on 27th March which will be led by Rev Jon Lyndsey-Scott of St Chad’s Church in Romiley. At this service there will be an opportunity to donate to a local charity. All money collected will contribute to Romiley Ark. 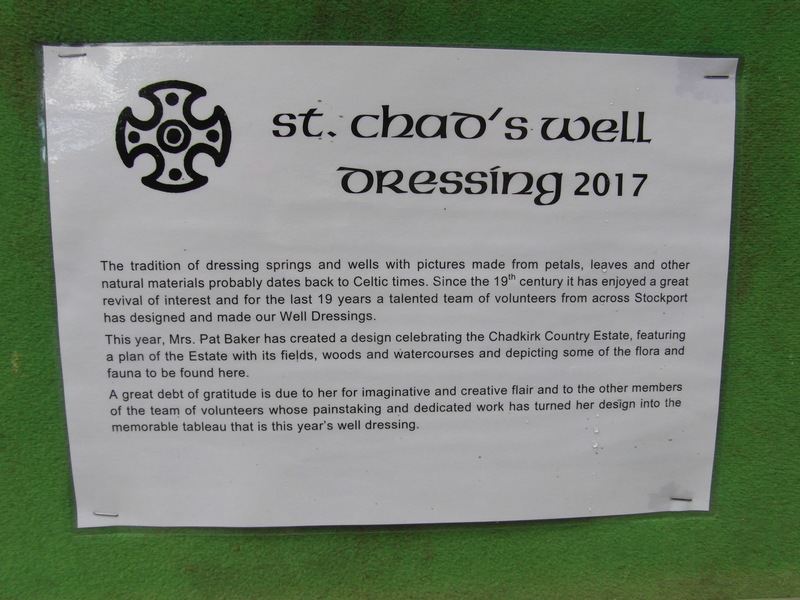 For Friends of Chadkirk there’s a familiar seasonal rhythm to the activities, though with a little twist each year. Things change, so there’s also adaptation to make the best of what’s going on here and further afield. As a result there has been a change to the pattern of some of our regular activities. 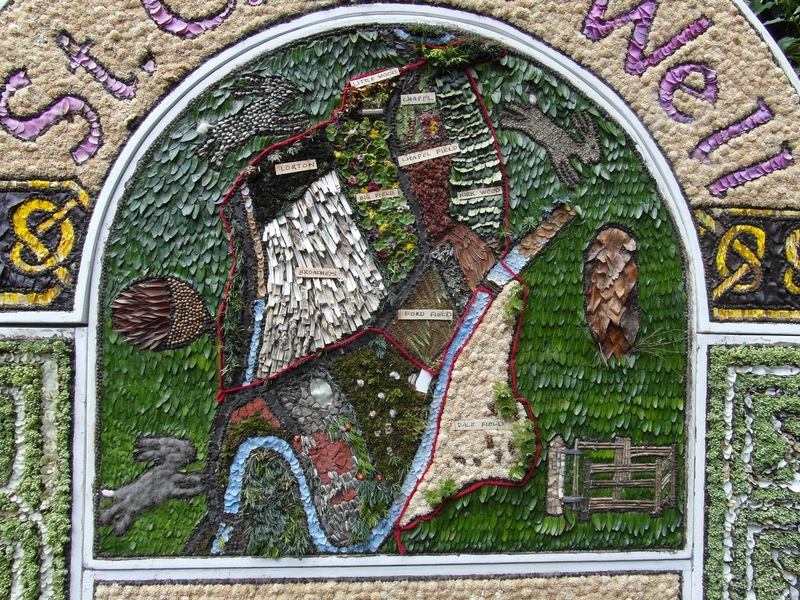 This year, for one year only, there’ll be Well Dressing Blessing on Saturday 30th July. . With the Blessing at 1pm, an opportunity for refreshments in Chadkirk Chapel, and the plant stalls and Friends of Chadkirk stall with a range of small treats on offer. Outside the Stockport Silver Band will play. The council will be working with the Friends of Chadkirk on the format for the festival for the weekend 29th/30th July 2017. This means that we’ll be celebrating our 20th Chadkirk Festival in 2017. Our expanding team of enthusiasts have plenty to look forward to. Down at Chadkirk, Friends of Chadkirk make a difference to all most every aspect of this special place. It can be life enriching, community enhancing, ecologically sustaining, landscape protecting. Beneficial. Be-friending. Want to make a difference? Take part. Join in. Be-friend.